device's Power-On/Off are toggled by a pushbutton hold or upon a battery undervoltage condition (@ 3.2 V). The below schematic shows the Power-related section of my circuit so far. Note that Microcontroller and Sensor are NOT shown here. REG-ENABLE: Enable/disable Signal sent from output pin of STM6601 IC to the enable-pin of TPS63001. Short summary of my overall approach: From the battery's supply, a buck-boost regulator provides 3.3V for the uC/sensor. This 3.3V supply is enabled/disabled (PwrON vs PwrOFF) by a specialized controller IC, which monitors for either pushbutton event or battery-undervoltage. USB power is used to charge the battery (whose voltage is measured periodically by an ADC pin on the uC). That's it. MCP73871: Battery-charging IC that uses ConstantCurrent-then-ConstantVoltage approach to charge the Li-ion. I set the pins on the MCP73871 to power the charging with USB (5V) with 500 mA current. Initially when the STM6601 detects the pushbutton as held for a duration, then it sends out a HIGH signal, which is connected to the TPS63001, thus enabling it, and bringing the device to life. When the STM6601 detects either that pushbutton is held again OR that the battery voltage falls below a 3.2V threshold, then the STM6601 automatically sends out a LOW, disabling the regulator. The divider is used to bring down the battery voltage to within the 3.3V maximum allowed on the microcontroller ADC pin. The ADC takes battery voltage measurements periodically, which is mapped to curve of discharge level, for a rough indication to device user. MY QUESTION: Do you have any suggestions regarding this layout and approach? I am interested in any feedback you might have. Given my non-experience with any professional layout, I am expecting there are at least a couple of things "wrong"! Or things that could be improved upon; so I'm frankly open to any suggestions that I can learn from, small or big, even if they require me having to re-think/re-build the circuit. Looks good. No obvious "funnies" at a quick glance. You have set charge termination = 10 mA typical (PROG3 = 100k to ground). 500 mA charge current is fine as long as battery tolerates it. LiIon typically allows 0.5C to 1C max charge rate (depends on manufacturers spec with some few higher. LiPo is usually higher. So this should be OK for 1000 mAh battery and probably for 500 mAh but do check battery data sheet. Buck-Boost often have a nasty efficiency dip around the boost to buck transition point and TPS63001 is one such. Mainly evident at low Iout and not vastly bad power wise, but can be worth being aware of. Be certain to use an internally protected battery pack. While you hope to avoid "vent with flame" events, it is a bonus if you can locate the battery so it can "melt down" without destruction of itself or of the area it is housed in. While I have read a large amount about LiIon and LiPo destructive events I have never seen one and never met anyone who has experienced one personally. Percentage wise the incidence is probably very small. I once tried to induce some LiPo cells I have here to self destruct by applying gross over voltage - with no success. The charger IC seems to come in 4.1, 4.2, 4.35. 4.4 Volt versions. If you use the 4.1V version you decrease battery capacity, increase cycle life - perhaps significantly, and give yourself more safety margin. The table below is from the Battry University website (copied in this case from stack exchange "Charging affects battery life" which may also be useful. This suggests an ultimate capacity of about 87% of maximum possible just by dropping Vmax by 0.1 Volt! Affect on battery mechanical stress may be significant. If you care about ultra long battery cycle life consider using LiFePO4 battery. This charger IC will not accommodate it. Vmax is 3.6V, most energy is delivered in the 3.0 - 3.3 V range so you would be boosting for most of the battery life to get 3.3V supply. If using Lithium Ion you could consider the merits of using a linear LDO regulator for the 3V3. This means you "waste" the energy below about 3.4V which is about 75% capacity at 2C rate and 90%+ at 1C rate. If you use a 1000 mAh battery then 400 mA = 0.4C and you would get 90% + of battery capacity with a linear regulator. Here are some "typical" curves which need to be checked against temperature, load and actual cells used in your case. At 4V in a linear regulator is 3.3/4 = 82.5% efficient and at the lower load mean of about 3.7V it is 3.3/3.7 ~+ 90% efficient. Your buck-boost is quite possibly no more efficient across the battery range. Not discharging LiIon below 3.3V is going to greatly help its cycle life. IF you can tolerate the loss of capacity from using Vmax = 4.1V when charging and a linear LDO regulator you get a very long life battery with no switching regulator noise issues. Overall battery cost will be higher for a given capacity but the whole of lifetime battery costs may be superior due to the long cycle lifetimes. With LiIon you still need to contend with calendar life - the battery just "gets old" even if little used. Curve below copied from When to stop draining - which also may be worth reading. You may wish to consider using a resistor diivder from Vin to the VPCC pin to provide low Vin shut down. This sets lowest Vin that will be tolerated. (Strapped to Vin at present which disables it. This is a valid option). May not be useful in your application. You have battery thermal input going direct to P$5 at present - which is wholly valid. But, ensure battery used uses a 10k thermistor (as most do) and not some other value (as can happen) and consider whether you want to tailor the valid thermal range for you application by adding series R in the thermal sense line (covered in data sheet). The buck-boost circuit will introduce some ripple on the 3.3V supply by nature of the fact that it's a switching regulator. If you need the 3.3V supply to be squeaky-clean (if it's going to be used as an ADC reference, for example) you may need a separate LC filter to smooth it. (400mA is tough for a linear post-regulator to carry). You may want to consider a picofuse in series with the battery positive feed, just in case something goes catastrophically wrong (a shorted battery won't power the logic to sense the temperature). I assume the battery header will prevent accidental reversal of + and -. Not the answer you're looking for? Browse other questions tagged pcb voltage-regulator switches layout charger or ask your own question. LiPoly Battery - When to stop draining? 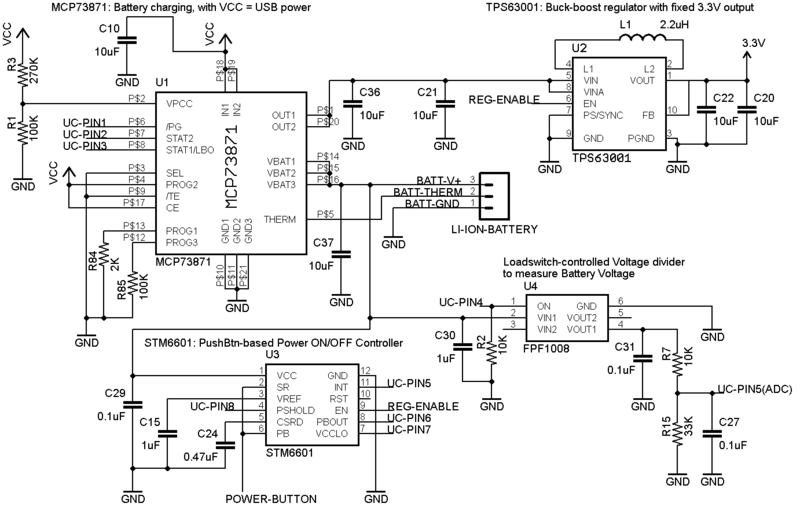 What is a good voltage regulator or voltage regulating circuit for my micro-USB battery charging needs?